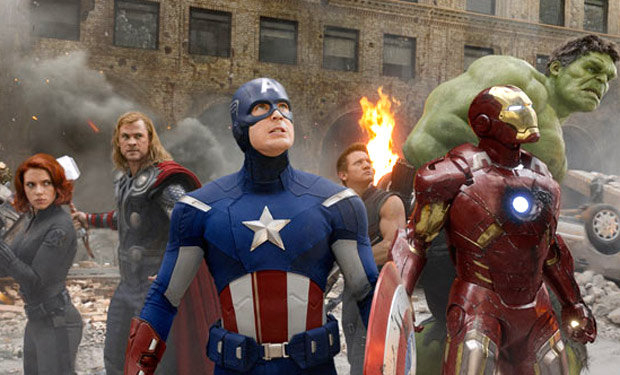 It’s not hyperbole to call The Avengers the greatest superhero movie of all time — better than Captain America: The First Avenger, better than The Dark Knight, and better than Spider-Man 2. And the best superhero movie is available on Blu-ray and DVD starting today. The cardinal sin of most superhero movies is that producers change too much from the page and the screen, and then crowd the story with too many characters (especially villains) that all have to be introduced. So how does Avengers — a movie featuring six heroes, a villain, a host of supporting characters and an entire top-secret international organization — manage to not only avoiding becoming an overstuffed muddle, but pull it all off brilliantly? Whedon was hired to write and direct The Avengers, and his vision for and realization of the project were so pure and strong that they kept him focused on making the movie every comic book reader has dreamed of: fully realized superheroes doing exactly what we imagine them doing. And these characters are all recognizable from our comic books. The story begins at a secret base where SHIELD, a global peace-keeping force, is experimenting with the infinitely powerful Tesseract, recovered from the ocean floor after the end of Captain America: The First Avenger. Suddenly, Loki (Tom Hiddleston), the villainous half-brother of Thor, invades and steals the artifact. Loki has teamed up with the alien Chitauri from deep space, and plans to conquer the Earth with his new army and the Tesseract. In response, the head of SHIELD, Nick Fury (Samuel L. Jackson), activates the Avengers Initiative, a plan to use Earth’s superpowered heroes as a defense. The Avengers include Captain America (Chris Evans), Iron Man (Robert Downey Jr.), Thor (Chris Hemsworth), Hulk (Mark Ruffalo), Hawkeye (Jeremy Renner) and Black Widow (Scarlett Johansson), a gaggle of strong personalities with clashing ideologies and methods, but who nevertheless have to work together to stave off the end of the world. First off, Marvel could not possibly have made a better choice for writer/director of a widescreen action movie than Whedon, who knows comic books inside and out, as well as how to make characters with superpowers in extraordinary situations relatable and… fun. Whedon knows what comics fans want to see, and he understands what movie audiences demand from their summer roller-coaster films. 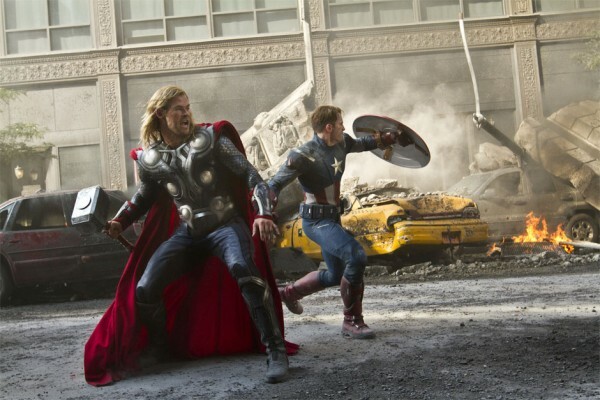 The Avengers is one of those 1-in-a-million movies that manages to please fanboys and mainstream audiences at the same time. Whedon took the toys he was given and took advantage of a great asset: Marvel had already introduced all of the characters, so Whedon wasn’t burdened with telling a bunch of origin stories. Every hero (save Hulk) was introduced doing his or her thing, so Whedon was able to show — instead of having tell — who theses characters are. Some — like Iron Man — were already well-established, while others —like Hawkeye and Black Widow — allowed room for Whedon to stretch his legs and show off his creative chops. Creative abilities that Whedonites have long known he possesses. This movie has just about everything: drama, action and thrills, as well as sadness and a sense of humor that ranges from witty wordplay to slapstick hilarity that will have you laughing out loud. It also has several scenes of nobility and heroism that will have the hairs on the back of your neck standing up. Because this is Whedon, folks — creator of one of TV’s greatest-ever heroines, Buffy the Vampire Slayer — all of the heroes in this “Scooby Gang” get chances to shine — including the human SHIELD agents, Fury, Phil Coulson (Clark Gregg) and Maria Hill (Colbie Smothers). And just because she’s the only girl, Black Widow is far from marginalized; that fact just makes her more valuable to Whedon. She is right in the thick of things to the very end, making use of her mind and fighting skills to such a degree that she even impresses Cap! Speaking of which, one of my favorite scenes came late in the movie, as the Avengers realized the scale of the threat they faced, and the Stark-Rogers rivalry melted away as Iron Man deferred command to Captain America with a simple: “Call it, Captain,” letting Cap delegate their forces. In the comics, Cap is the consummate leader and strategist, so naturally Whedon would put aside the rivalries and play up Cap the living legend. And — because this is Whedon — the audience also can count on another of his trademarks: The shocking death of a beloved character. I give it away, but Whedon knows exactly whom to kill (and precisely when and how) in order to wring out not only maximum pathos, but story. Which brings us to the film’s greatest strength: its characterization, which makes everything else — all the drama and all the humor — possible. Since we get to feel like Tony Stark and Steve Rogers and Bruce Banner and the Natasha Romanoff are our friends, we care about whether they get hurt, or if they succeed in saving the planet. We can understand Thor’s frustration with unruly brother Loki stems just as much from sibling rivalry as a desire to spare the Earth from destruction. And how much of Loki’s plan is lust for power, and how much is jealousy that their father, Odin, likes Thor better? Listen to his speeches. Rogers: Is everything a joke to you? Banner, in contrast, has a much drier sense of humor, and the cynicism of both Hawkeye and Black Widow clearly came from different places. That comes from truly directing actors, folks. 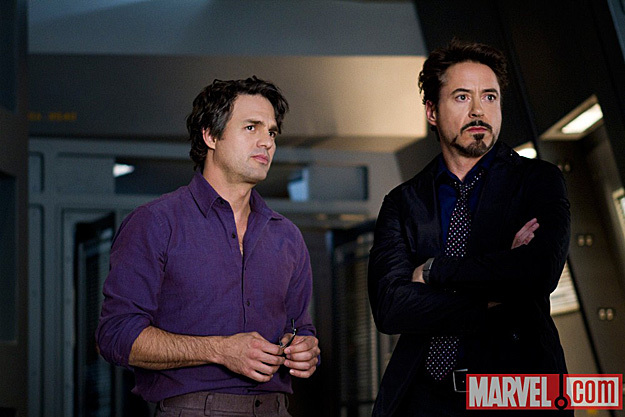 My favorite performance was Ruffalo as Bruce Banner. His soft, Zen-like delivery of his lines reflected the deliberate choices of a man determined to remain in control of himself. The most famous line from THE INCREDIBLE HULK TV series — “Don’t make me angry. You wouldn’t like me when I’m angry” — gets turned on its head by the deadpan revelation from serene, self-controlled Banner that, “I’m always mad.” And yet — after one bad movie and its “meh” sequel — we finally like Hulk. (That may be Whedon’s biggest accomplishment in Marvel’s eyes.) On the next level, I put Downey Jr., Evans and Johansson. The constant back-and-forth between Stark and Rogers really helped advanced the story and team dynamic, as well as tease out backstory without being boring. And with so much fighting, how could this movie ever be boring? Whedon manages to put a spin on the hokey comic book convention of having heroes fight each other and makes it believable. He sets up the battles fans actually want to see: The Thor vs. Iron Man throw-down is just epic as I imagined it as a kid; and who doesn’t want to see whether Cap’s shield can withstand a direct blow from Thor’s hammer when struck in anger! Wow! And then there’s the alien Chitauri, whom the Avengers can fight with all their might and mangle and kill without remorse, and the giant robot dragons that give Hulk a chance to unleash his full power. 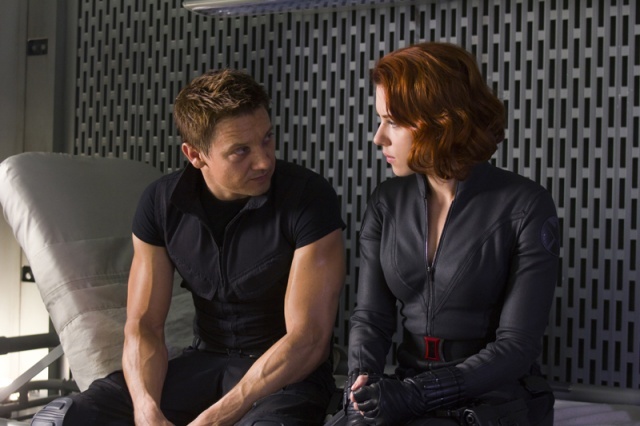 But even while depicting universe-shaking clashes, Whedon still features battles for the more down-to-Earth archer Hawkeye and martial artist Black Widow. Clearly, this was a job for Joss Whedon! And he was just… super. N.B. : Be sure to watch through the credits, because a special extra scene puts the cherry on top of this movie and sets up the inevitable sequel. This entry was posted in Blu-ray/DVD, Movie review, Superheroes and tagged Black Widow, Captain America, Hulk, Iron Man, Joss Whedon, postaday2012, The Avengers, Thor. Bookmark the permalink. They could have dropped the ball with this flick, but they didn’t. Perfection! Hulk stole the show!